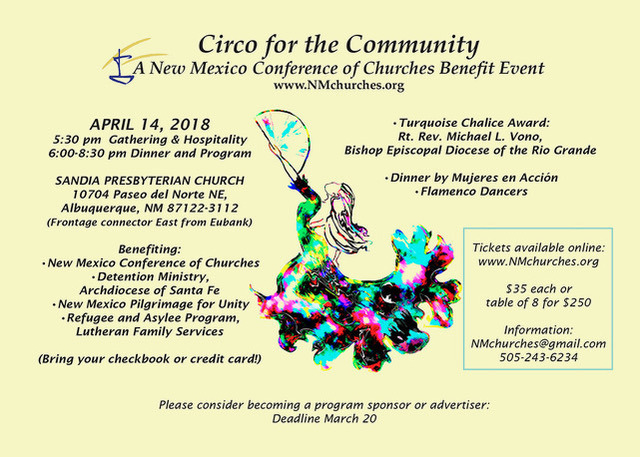 The New Mexico Conference of Churches invites the public to its annual fundraiser, Circo for the Community, on Saturday, April 14, Sandia Presbyterian Church, 10704 Paseo del Norte NE (map) Albuquerque, 5:30-8:30 p.m. Enjoy entertainment (Flamenco dancing) and delicious Mexican/New Mexican food (prepared by Mujeres en Acción). In most years, the event has honored an individual with the Turquoise Chalice award for his/her contribution to promoting the well-being of the community and ecumenical dialogue across the different denominations. This year, the honoree is the Right Reverend Michael L. Vono, Bishop of the Episcopal Diocese of Rio Grande. Past recipients include Rev. Carole McGowan (St. Thomas of Canterbury Episcopal Church & Episcopal Diocese of the Rio Grande), Ruth Hoffman (Lutheran Advocacy Ministry-New Mexico), Norbertine Father (now Abbot) Joel Garner, Rev. Ernest Falardeau (Archdiocese of Santa Fe), Bishop Ricardo Ramirez (Catholic Diocese of Las Cruces), and Marian Wright Edelman (Children's Defense Fund), among others. The event also serves as a fundraiser for three local organizations that have worked to meet the needs of the community and promoted the spirit of collaboration and ecumenical engagement. Last year, the Interfaith Hunger Coalition was one of the three beneficiaries of the event. Because of the funds we received, we were able to print brochures and cards, purchase a banner and hire someone to create our own website. New Mexico Pilgrimage for Unity. Help support these important ministries as well as the New Mexico Conference of Churches. Tickets are $35 for individuals and $250 for a table of eight. Buy tickets online or register (scroll down) to pay at the door with check or credit card.